It is additionally accessible in ABS and FI variation. The FI variation tracks the performance n as far as possible with Twin Spray Fuel-Injection technology which was developed with the team of experts from BOSCH – Germany. The ABS variation with Dual-Channel ABS and RLP (Rear wheel Lift-off Protection) control offers recognition and recuperation of the wheel bolt which offers the superior braking performance and the optimal cornering control. Fuelling the TVS Apache 200 is a 197.75cc, oil-cooled, single-barrel engine that creates 20.5PS (Carb) and 21PS (Fi) at 8500rpm, with 18.1Nm of torque delivered at 7000rpm. The motor comes combined with a 5-speed gearbox and shoe grip, which is a first in the 200cc fragment. Its double cradle support outline is suspended on adjustable front forks and a monoshock unit at the back. 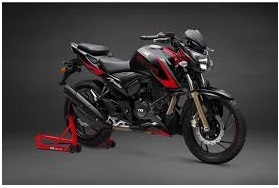 The bike accompanies stock TVS Remora tyres. The Apache 200 gets a 270mm front disc and 240mm rear disc braking with first in its segment the dual channel ABS. The model offers the A-RT which implies Anti-reverse torque slipper clutch. The model provides the O3C technology where O3C implies Oil cooled combustion chamber technology for the engine. The model also provides an electronic fuel injection system. The model offers KYB suspension. The model offers the spilt cradle chassis. TVS Apache 200 price ranges from ₹ 1.02 Lakh to ₹ 1.17 Lakh. (Whereas the Apache 200 price may vary according to the location). Thus select the variant of your choice for this exceptional racing bike.